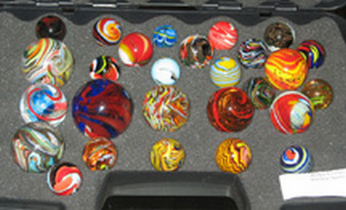 Glass shows where MAGWV info can be obtained. part of the educational mission of MAGWV"
Note postage for each itemis $4.00 and $1 for each additional publication. 2. Not available at this time. 37. Great Industries of the United States: Glass Making: Reprint of an article appearing in The Cosmopolitan Illustrated Monthly Magazine, June, 1904. Black and White illustrations. Not available at this time. 127. Consolidated Con-Cora, Regent & Other Milk Glass, 1951-1961. This volume reprints a complete Consolidated Con-Cora brochure from 1957 and a catalog from 1960, as well as a Regent 1954-1956 brochure and an earlier Regent cased glass vases brochure. Over 25 original photographs from the factory showing the forms and decorations used on milk glass during this period are also included. Compiled with a brief history by Tom Felt. 57 pages, many in color. $14.00 (non-members)/$12.00 (members). 128. Silverbrook Art Glass Company: Including a Circa 1940s/1950s Catalog Reprint. This volume includes a brief history of this American mid-century modern company, whose free hand animals are often confused with those produced by the Tiffin Glass Company, where the Kreutz Brothers worked prior to establishing their own factory. Also included is a small catalog from the 1940s or 1950s, advertisements, and photographs of Silverbrook pieces from the Museum of American Glass collection. Two appendices reprint first-hand accounts of visits to the Silverbrook factory in 1950 and 1962, respectively. The history, based on an article previously published in All About Glass, is written by Helen Jones, with editorial assistance by Tom Felt. 29 pages, some in color. $14.00 (non-members)/$12.00 (members). 136. Heisey Glass, Volume 2, 1906 to 1916. This is the second in a series of monographs that update and enlarge the classic reference works on Heisey glass written by Clarence Vogel. This volume covers the years from 1906 to 1916, the period during which most of Heisey's colonial patterns were issued. Included are all of the catalog reprints from Mr. Vogel's original work, along with additional pages not previously included, all of his text relating to this period from the Heisey Newscasters, with new photographs supplied when the originally published ones were not clear enough to reproduce -- an incredible amount of information packed into nearly 200 pages. As a pioneer in the study of Heisey, Clarence Vogel attempted to include all of the information then known on the subject; these updated volumes, in turn, are the most complete reference works based on our present knowledge. Additional volumes will be forthcoming. Written by Clarence Vogel, edited with supplemental information by Neila & Tom Bredehoft. 204 pages, illustrated throughout, with an index. $20.00 (non-members)/$16.00 members. 137. 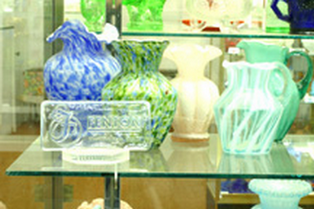 West Virginia Blendo Glass: Collecting Blendo from the West Virginia Glass Specialty Company. 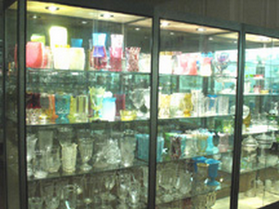 An overview of the colorful glassware made by WV Glass Specialty from 1956 until 1987. Profusely illustrated in a rainbow of colors showing large lemonade and smaller juice sets, cocktail sets, salad serving bowls, chip ‘n' dip sets, and many other pieces. Also included are dozens of catalog pages, illustrating virtually every piece made in these frosted colors in every imaginable hue. Information on the Colonial Glass Company's production of Blendo is also incorporated, as well as an appendix showing other decorations offered during this same period. This is the complete guide for collectors of this popular Mid-Century glassware. Written by Tom & Carolyn Durkin. 107 pages with over 80 full color photographs. $14.00 (non-members)/$10.00 members. 139. Heisey Glass, Volume 3, 1916 to 1930. This is the third in a series of monographs that update and enlarge the classic reference works on Heisey glass written by Clarence Vogel. This volume covers the years from 1916 to 1930, the period during which Heisey began offering many etchings and cuttings, as well as the beginning of the color period when flamingo, moongleam, hawthorne, and margiold were in production. Included are all of the catalog reprints from Mr. Vogel's original work, along with additional pages not previously included, all of his text relating to this period from the Heisey Newscasters, with new photographs supplied when the originally published ones were not clear enough to reproduce -- an incredible amount of information packed into nearly 200 pages. As a pioneer in the study of Heisey, Clarence Vogel attempted to include all of the information then known on the subject; these updated volumes, in turn, are the most complete reference works based on our present knowledge. Additional volumes will be forthcoming. Written by Clarence Vogel, edited with supplemental information by Neila & Tom Bredehoft. 193 pages, illustrated throughout, with an index. $20.00 (non-members)/$16.00 members. 147. From the Flints: The Unknown L. E. Smith, Volume 1, Lamp Parts, Shades & Other Lighting Goods: Drawings from the AFGWU Archives, 1935-1949. This is the first volume in a series utilizing the rare and unique drawings from the Archives of the American Flint Glass Workers Union. These drawings were submitted to the Union for determination of wage and turn rates. While sometimes crude, they are sufficient to make it possible to identify and date many previously unknown pieces manufactured by the various companies with Union representation. This particular volume contains all of the drawings related to lighting goods produced by the L. E. Smith Glass Company in Mount Pleasant, Pa., and its subsidiary, the Greensburg Glass Company. Included are 136 different items, many of them private mould work, and most of them never previously documented. Compiled with an introduction by Tom Felt. 89 pages. $14.00 (non-members)/$10.00 (members). "Special Offer! Set of all 11 Pilgrim Catalogs listed above: $110.00 ($74.00 member) (plus postage dependant on ship-to location)"
"Believe in the Magic" Pilgrim Cameo Glass Virginia Tech Exhibition Catalog: 10 pages, some color photos, listing of Cameo Glass with prices. $5.00 plus $4.00 Postage or FREE with above set! 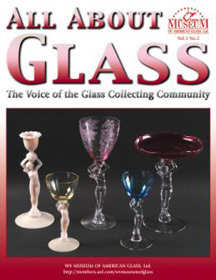 Back Issues of All About Glass: $6.00 each plus shipping. Back issues of the NewsJournal of the Early American Pattern Glass Society: Select issues are for sale at our Ebay store.